I am stoked to be introducing a brand new series to you guys today called 'Hip Mom, Smart Mom, Stylish Mom.' When I was pregnant, I thought a lot about what kind of changes would take place in me after the baby arrived, and if it would be difficult to maintain my individual identity and style. I knew that I absolutely wanted Essley to come first, without question - but I also knew that it was important to continue to stay true to who I was, and to continue to enjoy the things that made me ME, pre-baby. Well despite much less sleep and free time, a consistently messy home, and a wardrobe that is rarely wrinkle-free or truly clean, I can honestly say that I at least make a conscious effort to be somewhat stylish, to create a relatively healthy balance between work/family/life, and to remind myself that it's neither necessary nor appealing for me to fit into the mold of the stereotypical, traditional mom. 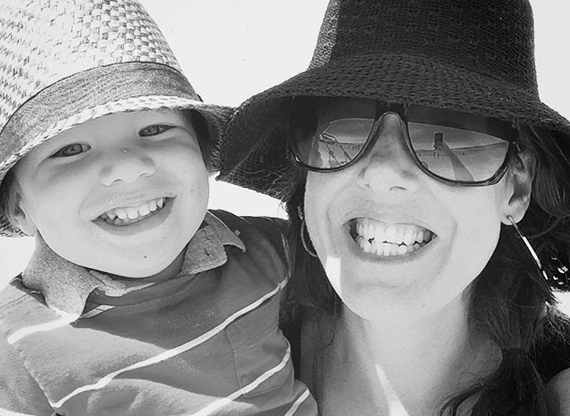 I'm lucky to know (and constantly meet) other moms who feel the same way that I do. These women are committed mothers who defy convention. They are true to their kids and true to their families, but also true to themselves. These moms are hip, smart, and stylish - and I'm thrilled to be able to share, in their words, what makes them that way. I first met our first hip/smart/stylish mama when I was working at a boutique in Ann Arbor, Michigan in my early twenties. I was a dreadlocked hippie who had just relocated from Colorado; she was a super chic, fashion-conscious high school student. We both moved away and lost touch for a few years, but reconnected almost a decade ago after very randomly running into each other at a late night Halloween party in Las Vegas (true story). Welcome the hip, smart, stylish, and wonderful Eva Marino. Welcome Eva! Please introduce yourself to Bubby and Bean's readers. Former stylist, boutique buyer, fashion industry worker, turned stay at home mom to two kids under two, Noah 23 months and Zoe, 3 months. I live in Portsmouth, New Hampshire with my husband Dan, our kids and two dogs, Cooper and Fred. I'm REALLY busy, all the time, but try to look my best every day. I'm telling you, it takes some effort, but it's totally worth it to me. I blog as often as I can - it's a great outlet for me creatively, and I like to think that its something that keeps me in the game so to speak. I've never been a fan of being asked to define my style in a number of words, but for sake of time and space, let's do it anyway. Define yours in three words. Classic, timeless, easy. I was joking with some friends though, that it could easily be called "lucky to have had a shower today chic." What is different (if anything) about your style/wardrobe now than before you had kids? The biggest thing, by far, is that I have to be able to wash and dry it in my machines. I don't have time or extra money for dry cleaning. Most of my tops and dresses before kids required dry cleaning. I save those now for date nights or nights out with my girls. I really do have a uniform now. Everything I wear is stacked and organized in my closet for easy grabbing. There's no time to mess around in my closet - especially with two babies. I know it sounds really cliche, but I get spit up on daily, and my son is always into something messy. I can't be upset if my clothing gets dirty. He is an active little boy and I want him to feel free to have fun, and me worrying about my clothes does not fit with that. :) Oh, did I mention it all has to be nursing accessible since I am exclusively breastfeeding my daughter? I am a stay at home mom to Noah and Zoe. We leave the house every day. Whether it's for a play date, a class, to the childrens museum, or the park, EVERY single day I wear a ruched long tank in black. I have literally eleven of these so that I can always reach for a fresh clean one in the morning to pair with skinny jeans or pants, and an open cardigan in a different color. I also wear Birkenstock Gizeh sandals in the summer, leather boots I splurged on in Italy in the fall/winter, and an infinity scarf for texture/color - I have countless scarves in beautiful prints. I got a gorgeous leather Liebeskind handbag from my husband for Christmas that I chose for its timeless look, neutral color and ability to double as a diaper bag. I also love adding bohemian touches with accessories. 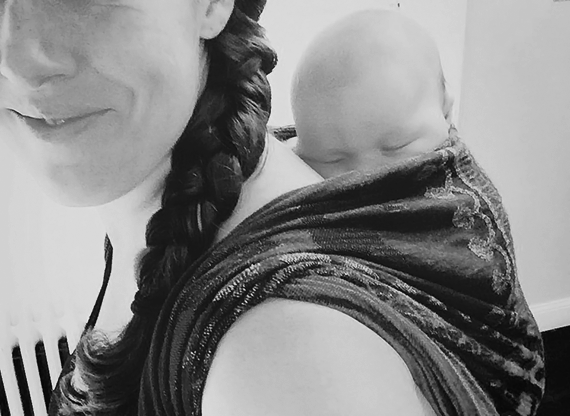 And I wear my daughter in woven wraps made from gorgeous fabrics pretty much all day everyday. I like dresses and will throw on a little dress or swingy top with my skinny jeans to dress it up a bit. Also big earrings are my jam! I love them but my son loves to grab them, and I like intact earlobes sooooo I save big earrings for nights out. 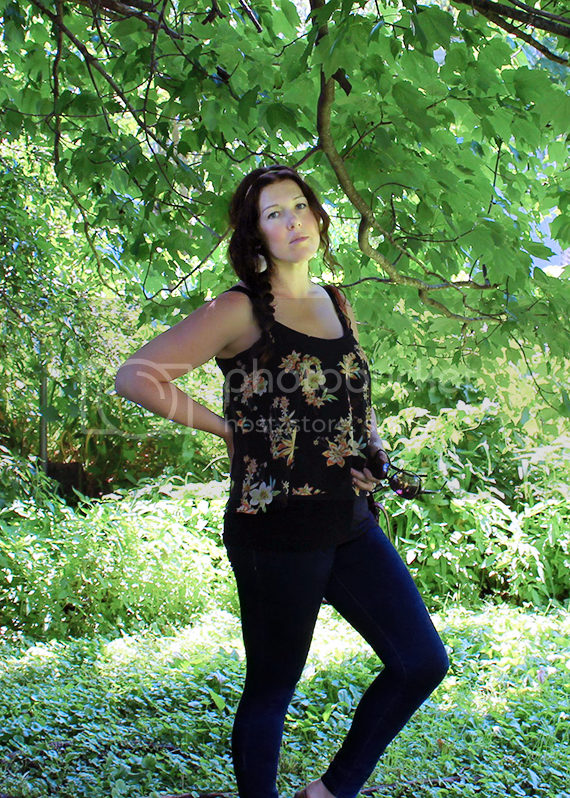 I call it my "canvas" - fitted stretchy tunic tanks, skinny jeans (love Hudson, H&M, and James jeans), swingy tanks, open cardigans. Can I add HUGE sunglasses? Anything I truly love I buy in multiples and several colors. I honestly love looking everywhere. I will buy something second hand or buy from a high end boutique - it's about high-low dressing for me. My favorites: Piperlime, Free People, H&M, Zara, Old Navy for easy dresses. Sometimes Target while I'm rushing by - I will just grab a few items. Right now they have a lot of swingy floral tanks which would be fantastic over my "uniform." Etsy for randoms, Rowdy Sprout, hand-me-downs!!! Tea Collection and Mini Boden are my tops. I buy when they have sales which is often. I also love Old Navy and Gap for basics. Carters onesies are the best, hands down. I feel like since I became a mom and quit my job (as a boutique buyer/manager and stylist), I've maintained the same effort of putting organization into being a mom and wife that I had put into my career. I make an agenda every night on my iPhone for the following day, and check the weather, and based on that, I set clean clothing out the night before - down to the shoes and underwear. Otherwise, I may end up wearing pjs all day. (It has happened more times than I can count - for real.) Also big for me is grooming - eyebrows tweezed, fingernails neat and polished with clear polish. I also use cuticle oil everyday to prevent ragged nails - I read somewhere that the appearance of your hands gives a lot away, and I believe it. I have a caddy under the sink that contains ALL of my beauty essentials - face wash, Clarisonic, jojoba oil, tweezers, Stila Tinted Moisturizer, Yves St Laurent Touche Eclat Concealer, and sheer gel blush. That's all the makeup I wear these days. I find that adding enormous sunglasses and my huge pearl studs goes a long way in polishing up my look. And every season I add a few more pieces. This summer it was a super versatile black ponte tank dress from Boden, a few filmy floral summer scarves, a Coolibar black woven sunhat, and my Birkenstock Gizeh sandals in tan. Anything family oriented makes me happy now. Seriously, a walk downtown with my husband and two kids to a park and getting coffee and an ice cream could be an epic day. I love being a mom, and I put my all into it. For this moment in time, this is my joy. 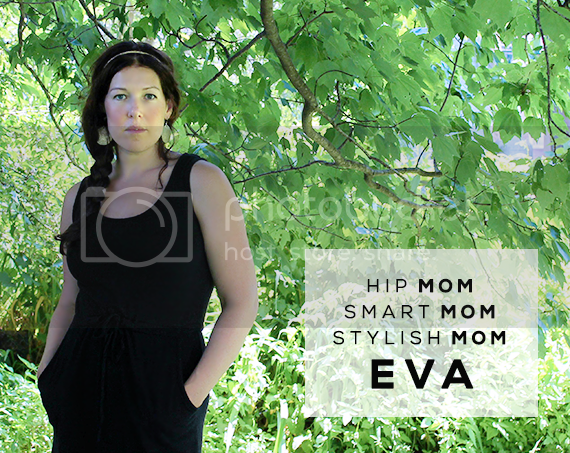 Thanks again to my old pal Eva for being our first hip/smart/stylish mom! 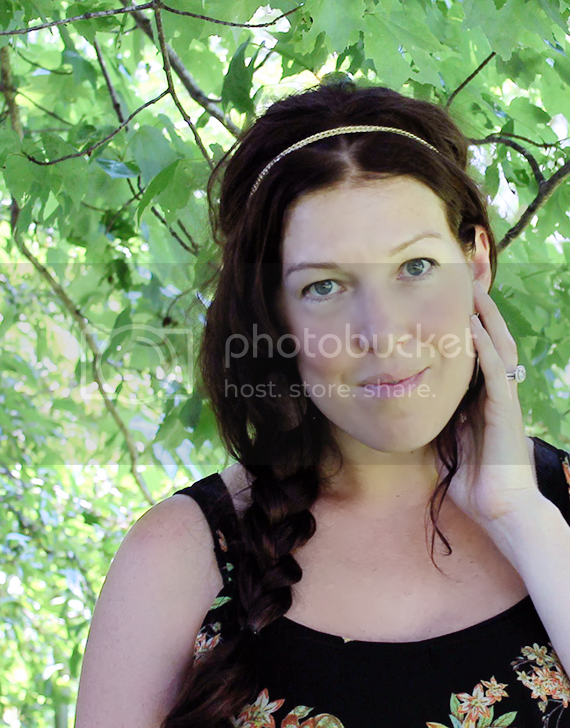 You can also find Eva over on her blog, Eva B. Style. This is a great idea for a feature! Since I plan to become a mom myself in the next couple of years, I like hearing about how life changes for different people. Yay! As a mom of one, with one on the way, I'm so excited for this series! Eva -you are gorgeous! And I really like your night schedule of making an agenda, checking weather, and pulling out clothes. I've been trying to more efficient around here, but am so not a morning person, and definitely think this would help me to get up and be ready to go. I like women who do not neglect themselves after becoming a mom! OK, so Day #1 for this brand new series, and I'm already loving it. I pinned it!